It's been a month since Kara's been gone... and the phantoms are taking over the earth, including Hawkman, Martian Manhunter and Mr. Terrific, and pretty much every person on the planet, apparently. Kara fights them off and gets a guilt trip from Sarah (from way back in Supergirl #10)... when she's suddenly attacked by Wonder Girl... who is also possessed by a phantom. Cassie gets Kara in her lasso and Kara confesses that she thought Cassie was weak for chasing after Connor when he died and Kara thinks she's stronger and better than Cassie is, and she liked messing with Boomer's head. And then she confesses she was sent to kill Kal. Cassie then reminds her that her lasso only hurts people and it's Wonder Woman's lasso that compels people to tell the truth, and then flies off. Supergirl flies off to see Batman, who's locked himself inside some sort of mountain fortress. A possessed Robin confronts her, and says he's Batman's child and Kara can't have him. She stabs him with one of her crystal protrusions, which brings him back to normal. This shocks Kara, because she thinks Robin is supposed to be dead. Kara tells Robin she needs to find Superman, and Robin gives her a tracking device because with what Superman's wearing, she can't find him. Cut to some possessed people trying to kill each other, when Superman in an iron suit shows up and tries to confront the phantoms, but they won't fight him. Suddenly Kara is there hugging Superman, and a man and a woman watch from the shadows. The man asks if the woman is finished. She calls him "Zor-El" (quotes and all), and says that until they know what path Kara will choose, he still belongs to her. Clark says he's put Lois in suspended animation at the Fortress because she was pulling out her hair. And somehow the suit he's in keeps the phantoms from overwhelming him. Kara tells him to just listen and she'll explain it all. Then yet another Supergirl (in Kara's more classic costume with the red skirt) shows up. Story - 2: Reviewing this issue was kind of like ripping a band-aid off. You know you have to do it, and you know it's going to hurt, and in the long run you know it's a good thing even if tears your hair out. Let me start by saying that in my review of issue #16 I mentioned Kara saw the phantoms as soon as she arrived on earth. This was a mistake as I was confused by an unclear sequence in the art which led me to believe we were seeing Kara's first arrival on earth at the end of the book. My bad. Apparently (we only find out now), the sun was turned RED and so I guess, at the end of issue #16... that was Kara's... magic... crystal powers encasing her as she fell back to earth. I am so sad I just typed that sentence. Looking back now, sure, in issue #16 the sun looks red, but on the first three read-throughs, it just looked like the sun. When it's a pivotal story point for the readers to know the sun actually changed colors, that point should be made clear. I wanted to clear that up for honesty's sake, but now let's move on to the issue at hand. Although, how does a father box exploding just conveniently turn a yellow sun red and that's just conveniently what the phantoms need to appear? And if the phantoms only appear under a red son, why did Zor-El send Kara to kill Kal when he knew he'd be under a yellow sun? Seems to me he'd know there was... no reason he needed to be killed. Kara was gone a month. Gone... where? She was in space with Power Boy for, what, a couple of minutes? Then she crashed back to earth. And now she says she's been gone a month? Where'd the month go? What was she doing during that time, trying recreational drug use and making guys who try to be nice to her feel like jerks for talking to her? That's my guess. Sarah turning up again was a nice touch, but how exactly did she get to... whatever city Supergirl is in with Hawkman, Martian Manhunter and Mr. Terrific? Quiet, reviewer boy, you ask too many questions! Kara confesses her feelings of superiority and her Gotta Kill Kal (TM) mission to Cassie. But since they've been trying (note, I say, trying) to establish them as good friends, there is absolutely ZERO reason Kara would believe Cassie's lasso compelled her to tell the truth. That was weak beyond weak. Almost as weak as a father box arbitrarily turning a yellow sun red which just so happens to free the phantoms and... whoops, there I go again. Meanwhile, deep in a mountain Batman screams and Kara stabs Robin. She apologizes. She says, "You're kinda supposed to be dead". Meaning the crystals usually kill people, as far as Kara knows. So... she either killed or thinks she killed a room full of kids on Krypton. And tons of other people. And Cassandra Cain (who is fine, sure, but Kara doesn't know that and still hasn't given a damn what happened to her). Superman is flying around in Iron Man's first suit which he got from who knows where and protects him from the phantoms who knows how. Glad that's cleared up! Who's the mysterious lady? And "Zor-El"? Dunno. Kara says she's going to explain it all, and then we cut to post-explanation. Then! Then, travesty of travesties, Clark wants to lay down and die. SUPERMAN, my friends, wants Kara to kill him. Because he feels guilty about the phantoms being his fault, you see, and thinks Kara killing him with her crystals will make them stop. Noble? If it were truly the last resort, maybe. But no, he says or tries nothing else. SUPERMAN is just ready to die because it's just all his fault. Whine! But Kara! The Kara who's been a self-centered, uncaring, selfish bint.... THIS Kara says there must be another way. Sure, the Kara we all want to see would say that. And that's the Kara we're all wishing we had instead of this... this whatever we have now. But for her to merely, suddenly, for no reason switch from being the horrible person she was before to the altruistic, hopeful person we long to see just reeks of desperation to me. WHY would the Kara that's been in this book from day one do that? I am all for the change, but there has to be logic behind it. There's no motivation. Now let's get to the issue of multiple Supergirls. I don't think I have to tell you we've had too many. First Kara, then Matrix, then Linda Danvers, and Cir-El, and Kara again (and I think there's a couple others in there somewhere, not to mention Power Girl). DC finally wants to clear this up and go back to just Kara. So we have Kara. Except that in the first arc, black kryptonite (siiiiiigh) splits her into two. Then she's recombined. In World War III, Kara returns from her time with the Legion, apparently, as two beings (both with the modern costume). And now... we have yet another Supergirl appearing, in the classic costume. Yep. That clears it alllllllllllll up. Thanks, guys. The story motion here was nice to see. Zor-El is "Zor-El". Perhaps Kara's been manipulated this whole time, Zor-El isn't a killer and Kara never killed a room full of kids. Keen-a-reeno! But selfish Kara was out of character, with no motivation. Superman was out of character period, because he was just ready to give up and lay down and die. And to finally have Kara say she's going to tell Kal everything and give us a conversation that should have occurred 10 issues ago... and then SKIP THE ENTIRE THING and pick up with Kara saying, "Our fathers screwed us up pretty good, huh?" is a cop out of monumental proportions. Supergirl: I know! Totally whoa, man. That does the fans and the characters a disservice. And now, yet another new Supergirl... even if she's finally one worth respecting (Linda Danvers, I miss you), and I certainly hope that she is, that means we've been reading about an impostor for two years now who actually isn't Supergirl at all. Did people learn nothing from the Spider-clone fiasco? Or, conversely, the Kara we've been reading about is the real one (which brings the same set of baggage it's had lo these seventeen issues) and we just have yet another new fake Supergirl, just so we can have another Supergirl vs. Supergirl story. Either way I think we're doomed. If you want Supergirl vs. Supergirl so bad, why not just go with a Bizarro Supergirl? Oh right, right... she wouldn't be as hot. Pick one and stick with it, and then work on logically moving her to a character we can actually like and root for and then hey, this book might be worth reading. Art - 5: ZERO complaints. I loved it... from the Wonder Girl splash page to the last page with the "classic" Supergirl, and everything between. The story may have left me in pain but the art was a joy to behold. Cover Art - 2: "Slayer!" And tons of dead people killed by Supergirl. The art is fine, I suppose, but, really... no thanks. 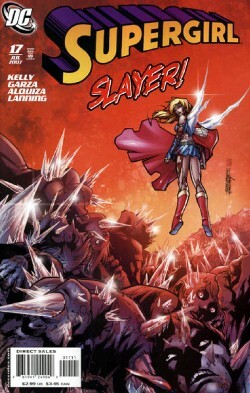 This is the kind of cover that makes me think... this book can't actually be about Supergirl! But then I guess that actually makes this cover kind of accurate in a sad sort of way.